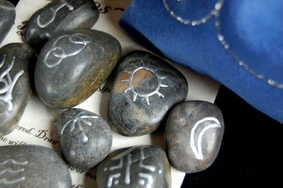 This is a set of 13 Handcrafted Witches Runes which have been Hand Decorated and Fired for durability. These Stones are very Tactile each having a beautiful colouration and are a pure joy to use. The Runes come with their own Handmade Blue Velvet drawstring Pouch which has been decorated with a Silver Triple Moon design. This Pouch measures approx 6" by 5 1/2 "
The Rune Set and the Pouch also come with a Full Instruction Leaflet containing the Rune symbols and their Meanings, and Casting Instructions.